Smile! 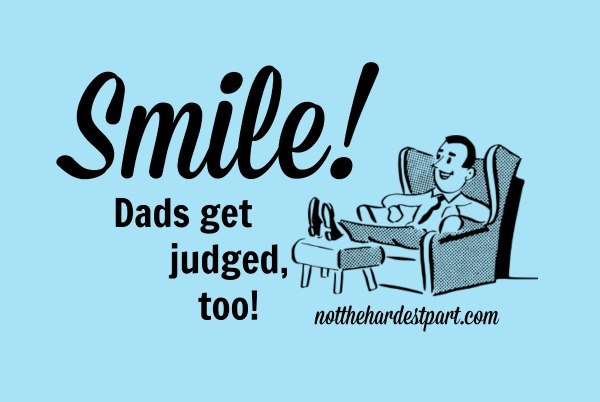 Dads get judged too! One of the super fun things about motherhood is the way everyone has a better idea of how to raise your child than you do. Whether you’re being lambasted on Facebook by Judgerson McGillicuddie when you post a picture of your 11-month-old eating bananas and OH MY GAWD HIDE THE CHILDREN peanut butter, or you’re being scolded by a senile hairdresser for casually mentioning your plan to sleep train your baby who isn’t even born yet, the world makes good and certain that you’re aware of your complete incompetence when it comes to raising your own kid. It’s nothing short of miraculous if your offspring survive to adolescence under your watch since – let’s be honest – you’re really only qualified to be the caretaker of a jar of earthworms. Ah yes, motherhood: damned if you do, damned if you don’t, damned if you breathe the wrong way. But huzzah! Complete and utter incompetence loves company, and that’s why I’m thrilled to tell you today that dads are just as awful at raising their kids as we moms are! What’s more, dads are not immune to the unsolicited tsk-tsks of nosy busybodies who have nothing better to do than point out their flaws in Whole Foods parking lots! Oppa! Last Friday was a pretty typical spring day. The sun was shining and the temperature was holding steady at 75 degrees when I dressed C in a yellow sundress she got for her birthday. It being spring, however, the pollen count was also through the roof, so she wasn’t in the best of spirits. Her sinuses contained several gallons of mucus and nary a Neti Pot could be found in our home. Against our better judgement (of course), neither B nor I thought to stick a sweater in her bag when we shuttled her out to my mom’s house for the day. We realized the error in our ways when we picked her up at 5:45 that afternoon and the typical spring temperature had dipped down to 53 degrees. Whoops? On our drive home through the icy tundra, we stopped at Whole Foods to pick up something for dinner. Not content to dine on the peasant fare of quinoa wraps and California rolls, C elected to have a complete and utter meltdown in the store when we vetoed her dinner selection of vegan sugar cookies and organic M&M’s. I really thought her tantrums would become a memory once she turned three, but I also once believed that the moon was made of cheese. So, y’know. Leaving a trail of snot and tears in their wake, B got her out of there within two seconds. He had a choice: let the kid scream bloody murder in the middle of the grocery store or remove her to the icy wilderness of the parking lot. Recognizing the sacredness of Whole Foods, he opted for the latter. And with that choice, he sealed his fate. He was an Awful Parent. As he held his screaming progeny in the parking lot and prevented her from diving headfirst to the fleet of oncoming Priuses, a pair of older women who know what’s best for everyone in the entire universe approached him to tell him that his daughter was unhappy, something he could have never deduced on his own. The reason for her unhappiness? The fact that she was inadequately dressed for the weather. He should have dressed her appropriately. My husband is a good person who generally treats people with grace even when they say the absolute most ignant nonsense you can concoct. This instance was no different. He nodded, Yes, this child is crying, yes, she is likely cold, and Yes, she is likely ill-dressed for the weather. As the know-it-all women walked off with nary an encouraging word, B stood there stunned by the absolute lack of shame some people have for doling out too-little-too-late advice to parents. I can’t help but wonder what they would have said if they had had their kale-buying excursion inside ruined by C’s screams. Truly, you cannot win when you’re a parent. You’re either ticking off grocery shoppers for not caving to your child’s ridiculous demands, or you’re receiving citations from the Grandmother Police for failure to pack a sweater on spring days. The good news, though, is that complete incompetence is not reserved for the mothers of this world. There’s plenty to go ’round for the dads, too. The leaps we’re making towards equality are really encouraging. Ha-hah-ha. I have been reprimanded so many times in Whole Foods because of my kids behavior when they were young. Let me tell you people are even MORE unforgiving about young boys behavior, they have no tolerance for it. I had one elderly lady tell me that she would take a belt to my child if he was hers, and I said I was probably safe in assuming her children were hardened criminals presently doing time in jail. She didn’t say anything after that. Loved, loved, loved the post – especially the army of Priuses. I shall chuckle about that for a while. Seriously? I cannot imagine how unhappy that person must have been in her own life to say that to you when you were clearly already in a stressful situation with your kid. You nailed it with your comeback. Yay magic talking stick! Lols. haha! The kids here walk around without a sweater at 2 Celsius. That’s how we show off to the rest of Canada that it’s balmy here. Our kids don’t mind! They love it! In early March (or even February) we start seeing shirtless men. We don’t really want to see that, but hey! We’re in the warmest part of Canada, so somebody’d better break out the moobs! You just won 20,000 points for incorporating “moobs” into your comment. Please proceed to the prize counter to redeem them for a finger trap or a giant aliens sticker. Something tells me she’ll insist on attending class with her daughter when she eventually goes to college. Kudos for the tongue-holding! Ugh. Other people can shove it. Major props to your partner for being so polite. My little one was 2 weeks old (born in summer) when we took him to the farmer’s market, and even then, two ladies told us he needed more clothes. In the heat. He was frickin fine, and we were just glad to be out of the house. Sleep deprivation means judgey people get their heads bitten off. Dude. Why do people think that clothes are as important as vaccinations? Because they are immediately visible, unlike vaccinations. Reblogged this on General Secretary. And these are the kind of instances that make me sorry-not-sorry my kid is being an a-hole in public and annoying everyone. People like that deserve to be annoyed. For sers. People go out looking for things to complain about. It’s a shame when kids and parents are at the receiving end of their general angst. I feel his pain. I once had a woman run out of a nearby office to chastise me for having a baby out in fifty degree weather in a diaper and t-shirt. My sole comfort was that she realized only too late that I was carrying was not, in fact, a suffering infant, but a Baby Think-It-Over doll. That’ll teach a busy-body. I would kill to be witness to that exchange! I was smug. I’m not proud of it. She laughed, at least. You mean…the moon isn’t made of cheese? The melt downs keep going beyond 3….especially in supermarkets! I probably would have had my own tantrum faced with two judgey Grannies! I had a woman once tell me that my infant should have a blanket on. I was walking two steps from a building to the car. People need to say something ENCOURAGING. Period. Reblogged this on moving beyond personal drama.